What’s the difference between a chalet and a cabin? In today’s Smoky Mountains, in the world of vacation rentals, these words can mean very different things to different people, and certainly not what they originally meant. Bottom line, always check on the features of your Pigeon Forge or Gatlinburg rental – cabin or chalet – to make sure you’re getting the things that are important to you. 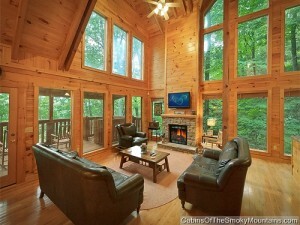 A cabin used to be a small building, but this meaning was changed forever when “luxury cabin rentals” became the norm in the Smoky Mountains. Huge structures with multiple bedrooms and bathrooms, fitted with modern luxury amenities and wrapped around with 2 or 3 levels of decks, are all still referred to as cabins. The original meaning of the Alpine “chalet” was an architectural style of sloping roof with large overhanging eaves, but as the term moved westward to Britain and the U.S. the holiday and ski industries used the word for their own purposes regardless of the building style. The A-Frame type of building that became popular in American mountain areas has given way to the log home style of building, certainly in the Smoky Mountains, and especially as modern building methods and materials became able to create a luxury living space using logs. Everything is hybrid now – many of our rental cabins feature smooth finished wood paneling inside and often outside, while some of the best rentals with the chalet feel use logs partially in the construction, and drywall for the interior finishing. Nowadays all that’s left of the comparison between chalets and cabins are on the one hand the vaulting, cathedral space inside a general A-frame shape of building for the chalet style, and on the other hand a more squared and sturdy appearance for the cabin. At Cabins of the Smoky Mountains, we refer to all of our properties as cabins, except when they get pretty big, and then we often use the more appropriate name of “Lodge.” And this is what’s really happened to today’s log cabin, it’s been styled after the traditional resort lodge, with smaller versions scaled down for fewer people, but proportionately still in the massive scale we think of with the lodge. The real key is luxury. 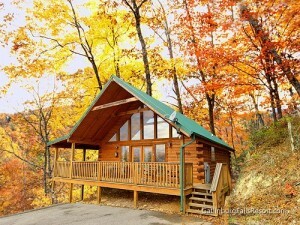 Cabin rentals nowadays involve luxury living, in a rustic area. Even with a dozen pictures it can be difficult to know exactly if your Gatlinburg or Pigeon Forge cabin rental will give you the experience you’re hoping for when you book your stay in the Smoky Mountains. This is why we encourage everyone to email or call us if they have the slightest question. We have more than 350 properties to choose from, containing a multitude of different features and combinations. Our front desk people are trained very carefully to help you make a perfect match with what you need. You might even be looking for more of a “chalet” feel than a “cabin” feel, or the other way around. But now that you know the names themselves are not reliable, let us match you up precisely with what you want. Call us at 866-34-SMOKY for assistance. If the lines are busy, remember they’re open 24 hours a day, so persevere, and end up with your perfect match!